Although it’s 2018, it’s still possible to experience a super slow internet connection. However, the inability to load a website is not always caused by a bad internet connection. It’s possible for your internet speed to generate quite good speed-test results, yet you’re still not able to load any website. There could be multiple reasons why that would be the case. In fact, the cause of the slow connection could be the speed cap of your Internet Service Provider (ISP) or no antivirus software, or an outdated version (malware can slow down your PC and internet a lot! For more information about the best antivirus software, check out my blog post on the subject). Finally, an issue with the Domain Name Server (DNS) of your provider could also be a reason for a slow internet connection. Obviously, making other adjustments to improve your internet speed is not going to work if your internet connection is very slow to begin with. Thus, if you experience overall slow internet speed, it might be time to contact your ISP and consider upgrading your subscription. However, if you’re paying for a subscription that should allow you to load websites and videos at a normal speed, and yet your connection is still slow, I do recommend that you follow this step-by-step guide before going to your internet provider to discuss this issue. As I mentioned earlier, another reason for slow speed could be malware on your computer. If you don’t currently have antivirus software or only have an outdated version, visit my blog post to deal with that issue. So, if your internet subscription is not the reason for your slow connection, and you’ve already set up sufficient malware protection, you’ve come to the right place to find the solution to this problem. In order to speed up your internet connection without spending any hard-earned cash, you can configure a custom DNS server. And the good news is: You don’t need to be a technical genius! I’ve written an easy-to-follow guide to help you configure your DNS default settings in order to generate a significant boost in your internet speed. Before diving into the practical steps, let me first explain and give you a better understanding of what exactly a DNS is and what it does. DNS stands for “Domain Name Server” and it’s basically a system that receives a domain name - for example, Amazon.com or 1and1.com - and translates it into an IP address. A user reads a domain name as a combination of alphabetic and numeric characters, but the servers work solely with IP addresses. For example, when you enter a domain to visit, it sends a request to the receiving server, which returns its corresponding IP address. A DNS can also deny specific IP addresses. For example, YouTube videos are sometimes limited to specific countries only. So, if you try to watch a video that’s blocked in your country, and the receiving server has your IP address - which is country-related - on a “blacklist,” it will return a “no access” message. PCs and other devices used in the online world use IP addresses to route traffic to the right destination. So, if you enter a domain, your DNS will search for where they can find that address. The receiving-name server will then “tell” your DNS what the address of the domain is. Your DNS will then give that address to your browser. With that address, your browser will then load the domain you submitted. While this entire process seems like it would take a long time, this whole cycle takes less time than it takes you to blink an eye! That being said, the network settings of your PC or router determine what DNS you can use. By default, the DNS that you are using is probably selected by your ISP. But there might be a faster DNS available for you! And I’m going to tell you exactly how to find a faster one to use. Now, you might wonder how to find a different DNS - and even if you actually find one, how do you know it’s better than the one you’re using? Luckily, Google is there to help us out. Google has created a program called “namebench” that will assist you in testing your own DNS and comparing it to other available DNS servers. Merely running the software tool won’t change any of your current system settings. On top of that, namebench is free of any charge! “Namebench is completely free and does not modify your system in any way,” promises Google. Downloading namebench is a fairly easy procedure. Simply visit this website and click on “downloads,” which is listed in the left sidebar. Obviously, if you’re a Mac user, select the first option, and for Windows users, select the second. Click on the blue file name. You’ll be redirected to a new URL and the download should start automatically. Note for Mac users: depending on your security preference settings, you might get a notification from Apple that namebench can’t be opened due to security reasons. However, this is a trusted Google application, so it’s perfectly safe to install. Now, once you’ve completed the download and installed the latest version of namebench, it’s time to configure the settings. For Mac users, you will see the following window. Note: the configuration options for namebench are exactly the same for Windows. The first bar will show the IP address of your current DNS - for example, 216.3.128.12. This is an automatically-filled field, so don’t worry that you see text in the example. The next two options, “Include global DNS providers” and “Include best available regional DNS services,” are primary search functions for namebench. It’s recommended to leave both boxes checked, because that will allow the tool to search for the best available options in your area. The section below, “Options,” includes secondary options. For example, it’s possible to block specific URLs if you select “Include censorship checks.” This option allows you to filter DNS servers and rank them by how powerful a DNS is at blocking unwanted websites. If you want to give back to the developers of namebench, you can leave the second option, “Upload and share your anonymized results,” checked. This option allows the tool to anonymously send data back to the developers for potential improvements. For the next section, you can leave “(automatic)” as the default setting for location, as it will determine your location based on your IP address. “Query Data Source” stands for the browser you are using. In this example, we’ll go with Google Chrome. However, if you have an unstable network - for example, you regularly experience connection timeouts - simply pick the other option. The last option is “Number of queries,” which basically stands for “the number of queries that are sent to each DNS.” By default, it’s set at 250. There’s no reason to edit the number of packages sent unless you’re on a slow network. If your internet connection can’t complete all the query requests, the outcome of the tested DNS servers analysis might not be accurate. In that case, I’d recommend to bring it down to 100 or 150 queries. Hit the “Start” button and let namebench search the best DNS for you. Note: this process can take up to a couple of minutes. The large box on the upper left will show you how much faster another DNS server is in comparison to the DNS you are currently using. On the upper right side, a box will appear with recommended configuration settings. The “Tested DNS Servers” box shows all the data and specific information per DNS server. In the example, the UltraDNS server is the fastest DNS server. 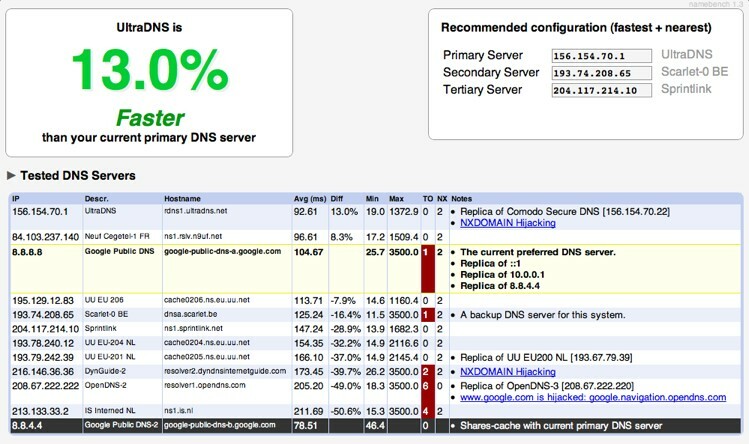 The DNS shown in the yellow box is the DNS server that’s currently active - as you can see, UltraDNS is faster by 13%. Now, you’ve been able to identify the best DNS server based on the configuration settings we put in earlier. It’s time to use the provided data to adjust the router settings, improve the internet speed and optimize your network as a whole. Click on “Start” and enter the keyword “cmd” in the taskbar. Click on the icon. Enter the following line: “ipconfig/all”. The highlighted sequence of numbers shown below is your IP address. If applicable, enter your router’s username and password to log in. Once you’re in your router’s main dashboard, look for “basic settings” or “Network” and click on it. What you see here are the “Primary DNS and Secondary DNS” addresses. It’s recommended that you write them down or take a screenshot of these addresses in case you want to switch back to your older settings later. Note: I put in a random primary DNS address and deleted the secondary IP in the screenshot above for security reasons. Now, we want to replace both the Primary and Secondary DNS with the data that was generated by namebench. Once you replace both the DNS server addresses, save the changes and log out from your router’s dashboard. Note: a tertiary server is only used if the primary and secondary DNS servers were unavailable. Hang in there, we’re almost there. But, before you can actually enjoy a faster internet connection, there’s one final step to take. Your old DNS server used to transfer the data from websites to your computer’s DNS cache - this is automatically done because it will speed up the process if you search for the same website again later. However, you don’t want this old cache slowing you down anymore, because you’ll want your faster and freshly-configured DNS server to look up websites from now on! Therefore, you need to get rid of the old cache. Note: If you’re running an older version of OS X, you can find the command list per version of OS X at this website. On a final note, this guide will not increase your available bandwidth, but it will certainly boost the performance of your internet connection. Also, DNS servers that are set manually are often more reliable than the standard DNS of your internet provider. Enjoy a faster internet connection in less than half an hour!